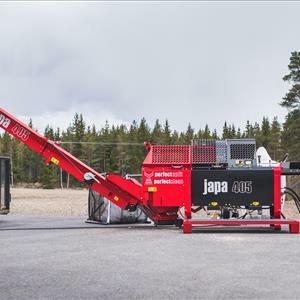 Fuelwood Factory is a combination of Woodcutta 400 and either Kindlet Pro, Splitta 360 or Splitta 400 to create a fully automated arrangement for converting timber lengths into split logs or kindling. Various options are available to extend the capability of the line-up. Woodcutta 400 converts the timber into cut rings using a hydraulic chainsaw, then transfers them to the Kindlet Pro or Splitta option. The rings are converted to a split product of consistent sectional size, regardless of the ring diameter. The sectional size can be easily and quickly adjusted from log to kindling sizes . The output is then presented for bulk loading or for bagging into net bags.